Going on a mission trip in 2008? You’re thinking about a mission trip in 2008 . . . and you have questions, perhaps for you, a friend or relative, students or a whole group . . .
Can I drink the water? But I don’t speak the language! You want me to sleep where? They eat what? How am I going to raise that much money? Is it really God’s will for me to go? I don’t know how to share the gospel. Are you ready for your short-term trip? How do you get ready? 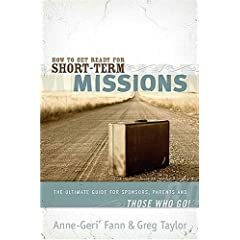 More than two million Americans will go into all the world on short-term missions trips in 2008. Are you ready to be one of them? Anne-Geri’ Fann and I have written a short-termers survival guide! We have years of experience as both long-term and short-term missionaries and have led teams there–and the always important . . . back safely. With humor and brevity–the book is just over 100 pages–we help you prep and pack for the trip, and we put our arms around you while you’re gone (I suppose you could cuddle with the book), and offer perspective as you re-enter “normal” life. With humor and experience, help you ask questions you can’t hide from and help you focus on your true mission, so you can act like the One you are calling people to follow while on your trip, and not like an ugly American! Order it from Amazon or find it at your local bookstore. I wrote this last January but never posted it, but wanted to share this on the one year anniversary of Moses Kimezi’s and Adam Langford’s deaths in Uganda. In through the cracks of pain come moments of illumination and joy. The only reason I can fathom losing a son or a brother now is because I’ve watched faithful friends do it with grace and peace and brokenness and tears and even great laughter. We have lost our incredible friends Adam Langford and Adam Kimezi, but being present with close family and friends in their suffering, says Adam’s last journal entry, is all we can do sometimes. Like most of you, Jill and I have experienced financial peaks and valleys. The peaks are not just windfalls of money. The peaks can be the blessing, hard-work and grace of God to pay off debts and be financially free to give away more. The valleys can be the reality of debts that can pile up when life hits you from different directions. An illness or surgery, braces or serious dental work, college, an accident–so many ways we can get financially derailed. You’ve experienced these things yourself! That’s why I’m very excited about the Crown Financial Freedom Seminar Garnett is hosting January 19, 2008. We’ve invited the community, put an ad in Community Spirit Magazine, promoted this widely in the community, and everyone is invited–both those struggling and those who are on solid footing but want to continue so and help others. Walk up registrations are welcome. Just show up Saturday at 8:15 am and register. Seminar starts at 8:45 and goes through 4 pm. Cost is only $25 each. Breakfast and lunch will be served for donations only. It’s time to go public with this . . . I believe oil and gas companies have the means and expertise to make a huge impact on the water crisis in the world. Americans are willing to pay more for water than gas. They buy water in bottles for what would amount to $8 a gallon or about $400 a barrel. At the same time, one billion people in the world have no clean water to drink. In the time it takes you to read this sentence, another person has died in the world of a preventable water-borne illness. Thousands daily literally pay with their lives for the bad water they drink. Not-for-profit organization are struggling to help drill wells, purify water, and they are not making a dent in the problem. What if not-for-profits meet with for-profit companies to address the water issues in the world? How can for-profit companies find viable ways to increase profits while helping the world water crisis? Or how can they be charitable in an area that relates to their core business of drilling/exploration/production. It’s not just oil and gas companies that can play an important role in addressing the water crisis in the world. I want to help unite companies with money and ability with those (currently mostly non-profit) organizations that are helping produce water in places worldwide that have needs. Why can’t for-profit and non-profits work together to find solutions? What can you–what can we together–do to help people have good water? This Saturday, January 12, 8 am-10am, in the Great Room of Green Country Event Center in Tulsa (12000 E 31st St. Tulsa, OK 74146), a small group of people will gather to start a conversation about how oil and gas companies can help produce water for many of the 1 billion people in the world today who suffer without the most basic need: water. Our guest speaker is Bobby Gardner who works with The Kibo Group (www.kibogroup.org), an East Africa development organization. Bobby and his wife, Candace, are leaving in a few weeks to do development in Uganda. They are looking for support from churches, individuals or companies for the ministry, water, reforestation, and economic projects they are doing. The goals of this meeting are two-fold: 1) to learn from each other what efforts are going on worldwide and to build synergy and not re-invent the wheel if some are doing a much better job in water projects, 2) find out how we can support those doing development projects and connect them with those in like industries, namely oil and gas with water projects and specifically the Gardners and generally the dozens of water projects going in many parts of the world. Here is a proposed agenda for the 2 hours. Coffee and continental breakfast will be provided. Please forward this to anyone in Tulsa or surrounding areas who may be interested. Contact Greg Taylor (gtaylor@garnettchurch.org) for more information or with questions.